Lock in a great price for Maison Sofia Hotel – rated 8.3 by recent guests! It was clean and comfortable. The staff was extremely polite and nice. There was green tea in the room with water jug, that I liked much. The hotel is right across the street from Rainbow Plaza where I attended an event so it was very convenient. Overall it's a nice hotel for a short stay. They have SPA with couple saunas and indoor swimming pool. Business room was very spacious. Breakfast was excellent with good variety. Service was quick and efficient and staff seemed pretty friendly. near to a bussiness center, nice staff, good spa zone with a sweaming pool. I liked staff's attitude - at reception and restaurant. They were very helpful, always with smile. 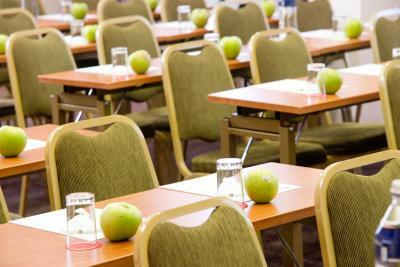 Hotel's location is perfect for business travelers -it is near business center, so no need additional transport. Wifi is free and speed is excellent. The staff , especially during breakfast were very kind and customer friendly.Breakfast was very good.It was clean. Beautiful garden, wonderful staff and great service. What a hidden gem of a hotel. And the restaurant served some of the best food we have had in Sofia actually. The room was very large, very clean, and the staff was very friendly and helpful. Maison Sofia Hotel This rating is a reflection of how the property compares to the industry standard when it comes to price, facilities and services available. It's based on a self-evaluation by the property. Use this rating to help choose your stay! 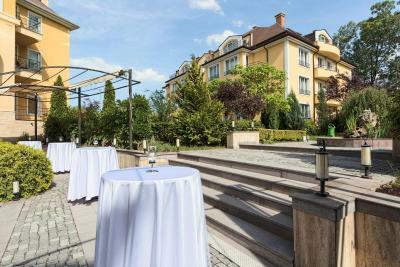 Located in Sofia's Lozentz district near the Tokuda Hospital, Maison Sofia Hotel consists of 3 buildings and features accommodation with large balconies and free WiFi access. Close to the property there is the Maleeva Tennis Club. Paradise Center Mall is within 0.9 miles. 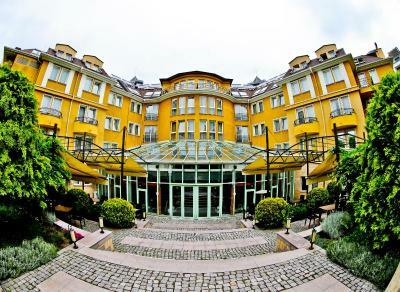 Sofia International Airport is 6.2 miles away and the city centre is 2.2 miles away. Subway Station James Boucher is reachable in 0.6 miles. 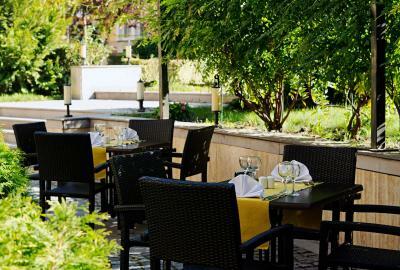 Maison Sofia Hotel's restaurant with its elegant and stylish interior has a capacity for 80 people in the lounge and 30 in the garden. It offers international cuisine, a weekly lunch menu as well as a fine wine selection. Other facilities include a business centre. When would you like to stay at Maison Sofia Hotel? Featuring air conditioning, free WiFi, a flat-screen TV with cable channels and a seating area with a sofa. A mini-bar is available. The bathroom comes with a bath or a shower, free toiletries and a hairdryer. Some of the rooms features a balcony or a garden view. A complimentary large bottle of mineral water is provided. 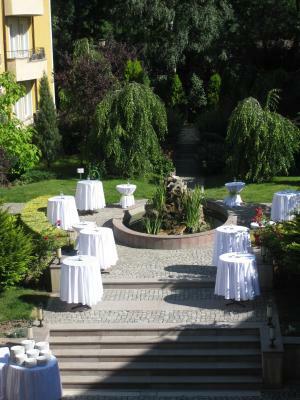 Unique park surrounding and charming green garden - ideal for relax. House Rules Maison Sofia Hotel takes special requests – add in the next step! All children under 12 years are charged BGN 48.90 per night for extra beds. Any additional older children or adults are charged BGN 48.90 per night for extra beds. Maison Sofia Hotel accepts these cards and reserves the right to temporarily hold an amount prior to arrival. Please note that the hairdresser studio will be closed from 11 December 2017 for an undefined period due to renovations. We stayed in a hotel as the meeting we had was at the walking distance. We appreciated parking possibility as the region around hotel is extremely busy. We didn't have breakfast, but lunch and dinner were excellent. The room was noisy near to the boulevard. Clean and cosy hotel. The fitness room is well equipped. Not perfect location, nothing around the hotel. The mini bar was empty by default, and it would have been good if there was a bottle of cold water in the room. In any case there was a note left on the table with phone number and instructions if one would like the mini bar refilled. The staff was friendly, although I didn't needed much assistance. I have stayed in this hotel few times over the years and it's good to see that the quality of service has been preserved. Check-in was a bit slow and we were asked to pay in advance, which is OK, but not the practice I see with nice hotels. I was really frustrated with the TV channels, as more than 50% of them were not available an there was some error. I would not think this is a good match for a Luxary Collection. Nice hotel with good, spacious rooms. Breakfast was good. Breakfast was a little disappointing for me.. I like fresh fruit and the choice was limited. There was a very sickly sweet smell in the hotel - it was quite a strong smell. Liked the Pool and Gym. Liked the large bedroom, full of natural light. Car parking needs improvement. We need to wait for 10 mins to get access. Nice bed and food is awesome.restaurant staff are very kind. The location is pretty far from city centre, otherwise it's ok. The rooms are nice, it's very good value for money, the staff was friendly and helpful.